Have you ever wanted to get rid of your gardener ? In a nice way of course. This homeowner got tired of paying for someone who comes once a week to mow, blow, grab a check and go. And it seemed that anything additional they wanted cost extra. Enough of that! The goal for the new garden was to create something beautiful that could be maintained by the owner, without machinery like a mower or blowers. As conservationists, another motivation was to cut way back on water usage knowing that California imports it’s water. Using this precious resource on a lawn, which dries out in the summer, seemed ridiculously wasteful. They received a rebate from LADWP for $800 for turf removal which required that the job be finished within a specific time period. They wanted a new look. 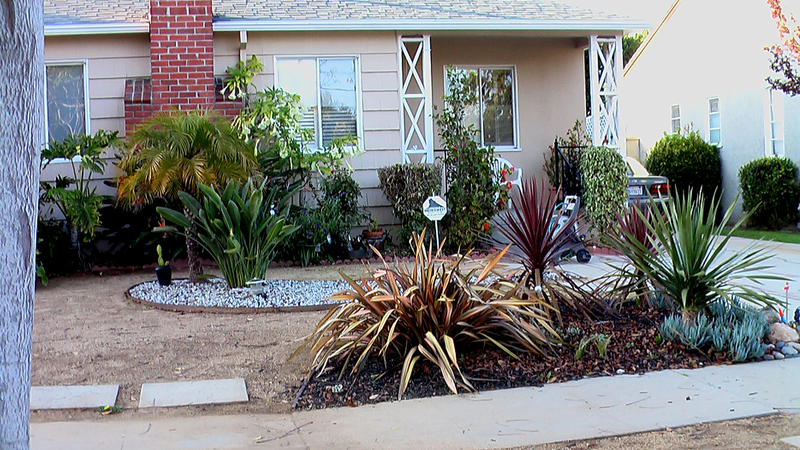 The one they created includes decomposed granite, rock and drought-resistant plants. They are thrilled with the look of the new front "lawn. " They continue to save money, as water usage remains low. And, as an added bonus, they keep the gardening fees for themselves!